Peter Baum ’13 was the first pick in the Major League Lacrosse Collegiate Draft held this past Friday. Student-athlete Peter Baum ’13 was the No. 1 overall pick in the Major League Lacrosse Collegiate Draft this past weekend, not a surprise considering he received the Tewaaraton Award last year as the top college lacrosse player in the nation. Baum won both the Tewaaraton and the Lt. Raymond J. Enners awards as the nation’s top lacrosse player in 2012. He helped Colgate to a 14-4 record and led the Raiders to the NCAA Tournament, where Colgate knocked off previously unbeaten Umass in the first round before losing to Duke. The Portland, Ore., native led the country with 5.39 points and 3.72 goals per game, scoring 97 points on 67 goals and 30 assists to earn Patriot League Offensive Player of the Year honors in addition to being a member of the Academic All-Patriot League Team. Baum is a geography major. His parents, Richard and Jill, both graduated from Colgate in 1978. 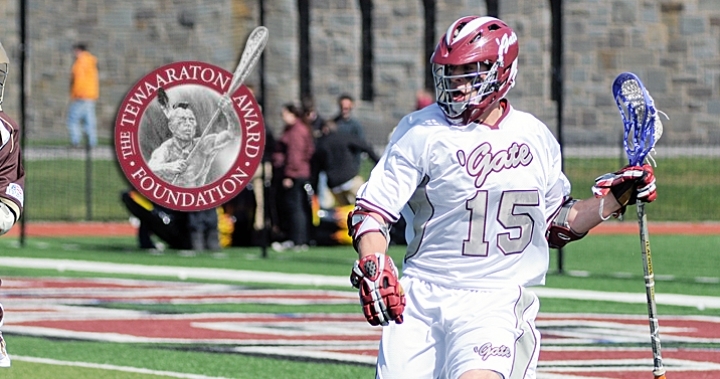 The senior heads into his final season at Colgate having been named one of three captains. The Raiders open play Feb. 9 at Bryant. Baum was selected in the MLL draft on Friday night by the Ohio Machine. Ohio, which plays at Selby Stadium on the campus of Ohio Wesleyan University, was one of two expansion franchises to debut last season in Major League Lacrosse. The Machine finished with a 2-12 record to claim the first pick in this year’s collegiate draft.